The Irish bottle opener is ideal for the kitchen or bar. 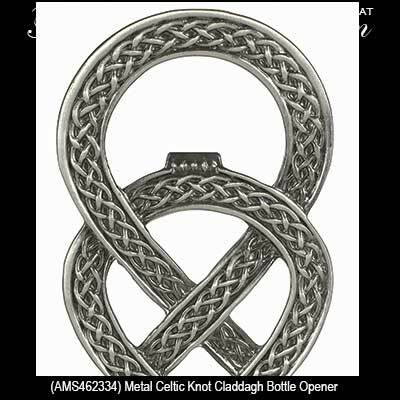 This Claddagh bottle opener with Celtic knots is both decorative and functional. 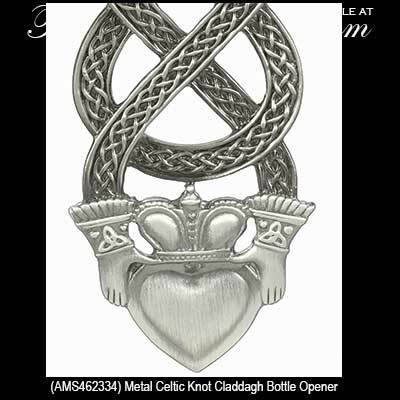 The hand held Irish bottle opener features Trinity knots on the cuffs of the Claddagh along with a knot work motif on the handle. This metal bottle opener measures 2" wide x 5" long and is gift boxed with Claddagh and Celtic knot history cards, complements of The Irish Gift House. Irish bottle opener is in the shape of a Guinness bottle. Guinness bottle opener is a magnetic design that features the famous toucan with a pint on his bill.